Image Archive: The SL-1 Reactor Accident - Radioactive corpse being removed from reactor accident site. 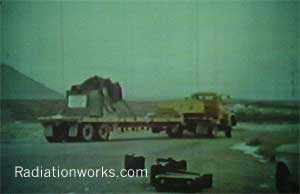 This photograph shows the a truck carrying the radioactive corpse of a reactor operator from the SL-1 accident. The operator was impaled in the ceiling of the structure by a control rod. Once his body was freed from the control rod, it was caught in a special truck-mounted sling, then transferred to this truck. The extremely radioactive body is inside lead blocks stacked on the end of the truck to minimize the truck driver's radiation exposure.